Our culture has quick, one-line responses to some types of grief. Platitudes. Something to say that fills space. When whoever says it doesn’t feel comfortable with talking about loss. Or pain. Confusion or emptiness. It can make it very lonely for the one who is grieving. If you are not trying to have a baby, then you may never know you miscarry. Yet many couples are proactively trying to become pregnant. They may be in denial about how many miscarriages actually occur. Miscarriage statistics indicate around 15% or a little higher in confirmed pregnancies. I talked to Dr. Kathleen Paulsen of Renaissance Women’s Health. She’s very concerned about couples who are emotionally investing in pregnancies that are only a few days old. Putting it on Facebook – “We’re pregnant!” after you have peed on a stick with a highly accurate detection system. Names being given. The rates of miscarriage for these pregnancies will be even higher. Yet they seem unaware of the risk. The potential loss may be more complicated. More people knowing. More questions to answer. By the time I had my miscarriage, I had been trying to get pregnant for almost 3 years. I had tried not to necessarily “connect” with this baby, knowing the danger. That didn’t work. I was way too invested. Everyone but the postman knew I was pregnant. A few days later, I walked into my trainer’s home gym. Tried to start working out. All I could do was sink down on a bench and cry. “I can’t put any energy into my body – I hate it”. She sat quietly and listened. Handed me Kleenex. Which is all I needed her to do. Like many other women, I was dealing with guilt. Confusion. Anger. Many times the reasons for miscarriage are completely unknown. You can rule out the major ones. “I don’t smoke. I don’t have diabetes.”. Dr. Paulsen gently reassures her patients who are battling this guilt: “There’s almost nothing you can do to make yourself miscarry other than to receive chemotherapy”. There are women who experience miscarriage multiple times. Their partners are going through a tough process as well. Often one partner takes an optimistic view while the other focuses more on the pain of the process. This causes misunderstandings. Arguments. Having a baby seemed so easy. Another risk. Less common – is to get through those first few months – 20 weeks or more of being told the baby is safe. And having your baby die in utero. Or in the birthing process. The March of Dimes suggest that 1 in 160 pregnancies result in stillbirth in the US. Rates vary in other countries, with more poorly developed ones have much higher rates. These parents go through the birthing process. And deliver a silent child. So what do you say? To those who have miscarried? To those who have given birth to a child that they may hold only a short time? 2) Ask what they need. What you can do to help. Maybe run an errand. Bring in groceries. If they have other children, take them out for a movie. Give the adults some time together. 3) Support them in the difficulty of their decision-making. Don’t interfere or give opinions unless asked. 4) Educate yourself about miscarriage, the infertility process or what happens after stillbirth. So you can be part of the discussion if asked. 5) Recognize that this is something that few about or support. It makes people uncomfortable. Deaths of babies are too painful. Miscarriages are often discounted. You may be one of a very small group that the couple can turn to for support. 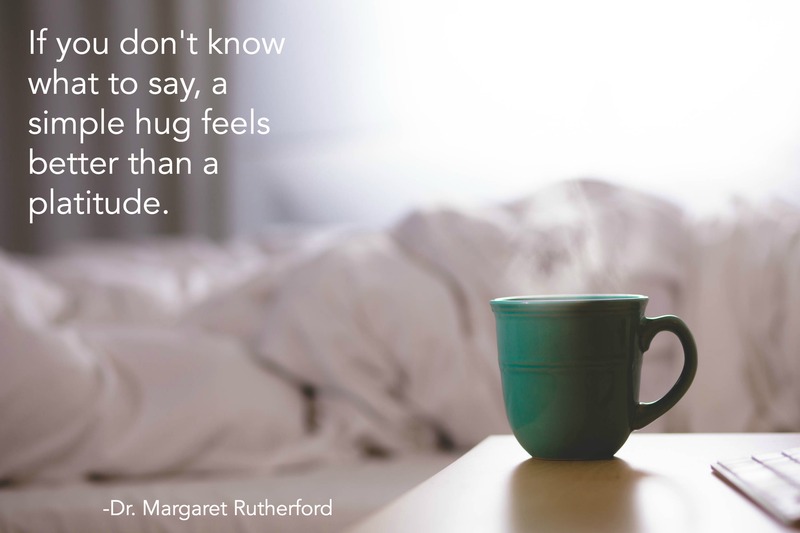 6) If words don’t come easily, then a simple hug can be enough. It can say all you need to say in a moment. 7) Don’t take things personally. If the couple can’t come to your toddler’s birthday party, it’s not that they don’t care. Maybe next year. 8) Watch how they are handling their own grief. They might distract. Maybe they are throwing themselves into trying to get pregnant again quickly. Or into work. You might need to talk to them. Remind them gently that you cannot replace one child with another. The grief will be there waiting for them. Or they may get stuck in their grief. One or both might need professional help. 9) Take care of your own feelings. You probably have your own grief to feel. Give yourself permission to do so. Maybe you can’t wait to become a grandmother or grandpa. Share that process with them but only as appropriate. If you are not sure what the boundaries are, ask others for advice. Note: There are new wonderful organizations out there who help these parents grieve for stillborn children. One of them, Mamie’s Poppy Plates, out of Little Rock, Arkansas, can receive the tiny footprints of these children and make a plate that will commemorate the birth and existence of that child. Please share and thanks for reading! SUBSCRIBE in the gray box above and receive a free copy of my eBook “Seven Commandments of Good Therapy”, a basic guide to evaluating your current therapy and/or how to choose a potential therapist. You can always privately contact me: askdrmargaret@146.66.99.73.